Altair provides an industry-leading portfolio of Multiphysics-enabled software to simulate a wide range of interacting physical models, leading to higher accuracy while saving time and cost. Paired with Altair’s multidisciplinary optimization, a wide range of opportunities open up to gain that competitive advantage. Altair offers a wide range of products to address combinations of physical phenomena, including fluids, temperature, multibody systems, acoustics, controls, hydraulics, electromagnetics, and structures. 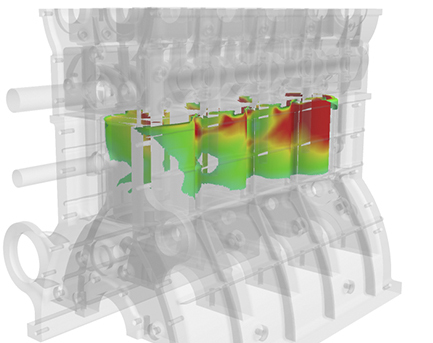 Enhance simulation accuracy by considering more physical aspects as the design advances. 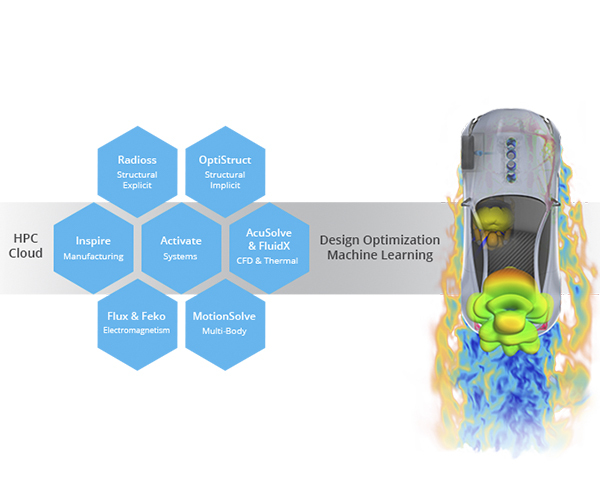 Satisfy the demands of all disciplines by applying Altair’s optimization-driven approach for the best possible product. Supported by the expertise of our teams of applications engineers and with Altair’s intelligent licensing system, there is an opportunity to discover the capabilities of all the software solutions Altair has to offer … it’s then up to you to explore the possibilities. Multiphysics, an interdisciplinary approach that spans many science and engineering disciplines, considers the numerous interacting properties and phenomena to resolve any particular problem. By ignoring or solving each process separately, overall system performance can be significantly compromised whereas by applying optimization-driven design, our users find the best solution to satisfy the specifications of all disciplines. 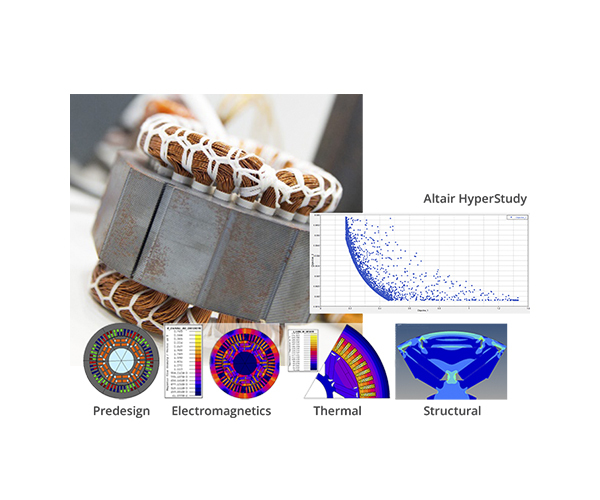 Altair HyperStudy enables Multi-disciplinary Design Exploration and Optimization, and especially Design of Experiments (DOE) to identify critical design variables and their contribution to each design constraint, hence the overall design performance. Knowing the most relevant phenomena for each variable lead to successful multiphysics solutions. 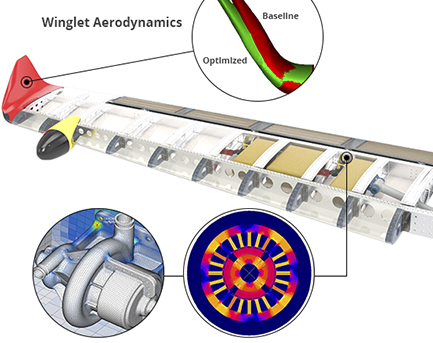 Two separate features are optimized in this example: fuel pump and winglet efficiency. Within the wing is the fuel pump which causes vibration and noise. Its performances must allow it to deliver fuel at the correct rate, while keeping noise levels and weight as low as possible. Without adding too much weight, the winglet needs to take into account stiffness requirements and vibrations. It also requires to be optimized to provide optimal aerodynamic flow to attain the best fuel efficiency. As an example of a Thermal Fluid Structure Interaction (TFSI) problem, combustion engine cooling is a challenge because models may be very large. Here, the total model comprising four cylinders + engine block + coolant jacket, requires 7 million nodes and 40 million elements mesh. Simulations feature temperature-dependent material properties and nucleate boiling modeling. An automated coupling process in Altair SimLab smooths the TFSI process. Thermal stress analysis is conducted in Altair OptiStruct. To attain 5-star safety levels, automotive OEMs include radars as part of vehicle advanced driver-assistance systems (ADAS) to automatically adjust the driving distance between vehicles. Based on its multidisciplinary approach, Altair HyperStudy helps optimize the front radar position and performance under realistic road use. 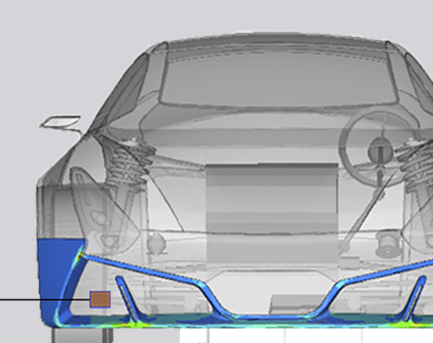 In this example the bumper is modelled as a flexible body with Altair OptiStruct®. The global vehicle movement is calculated using Altair MotionSolve®. Results are exported to Altair Feko™ for the high-frequency electromagnetic response. Determining electric motor noise is very important in the ever-expanding field of e-mobility. Altair HyperWorks enables noise to be reduced while maintaining motor performance. 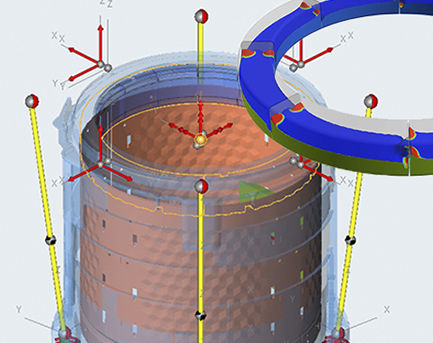 Altair’s Low Frequency Electromagnetic, Electric and Thermal Simulations Solution, Altair Flux™ accurately and efficiently calculates local forces on the stator with a 2D model. Using Altair OptiStruct’s Noise, Vibration and Harshness (NVH) capabilities, the noise generated by the motor at different speeds can be simulated. 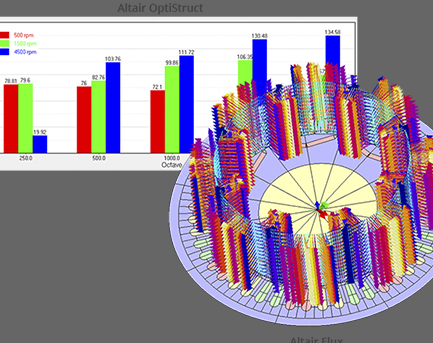 Results are then analyzed, and improvements made using Altair HyperStudy. Illustrating a One-way sequential Co-simulation: Thermal analysis is conducted in Altair Flux to determine the thermal loading within a commercially-available electric motor. The thermal heat source is applied to the Altair AcuSolve model to provide location-dependent heating. Altair AcuSolve is then run with these boundary conditions to provide an accurate account of the temperature within the motor’s radiator coolant and the oil in contact with the electrical coils. Without an effective counterbalance system, eccentric washing machines can shake themselves to destruction. Consumer-grade washing machines typically contain an internal component that is filled with water to counterbalance the weight of clothing inside the drum. Here, Altair MotionSolve™ - Altair’s Multi-body Dynamics Simulation Tool - simulates the rigid body motion of the washing machine. The fluid motion within the washing machine balance ring is captured by Altair AcuSolve™ - Altair’s Computational Fluid Dynamics Solver, simulation and the realistic fluid traction/torque is applied within the MotionSolve model. Thermal management is a concern for today’s increasingly electronics-orientated world using high-power, miniaturized circuitry. 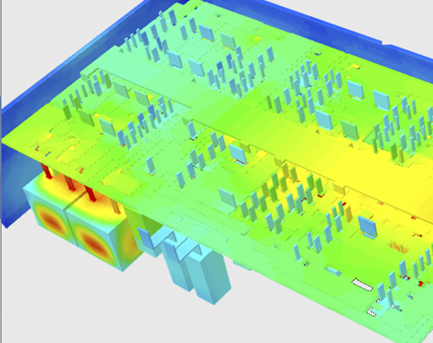 Efficient thermal analysis of circuits and design of associated cooling devices provided by Altair ElectroFlo™ enables solutions for electronics designers and analysts, without extensive CFD knowledge, looking to optimize design. Altair ElectroFlo predicts temperature distributions across assembles early in the design process to point-up problematic “hot-spots” and cooling inefficiencies that otherwise would remain unknown until the, much later, testing stage. This generic two-wheeled, self-balancing scooter with its rider demonstrates nicely a multi-disciplinary design approach that includes control systems, electromagnetics, along with multibody analysis at a system level. 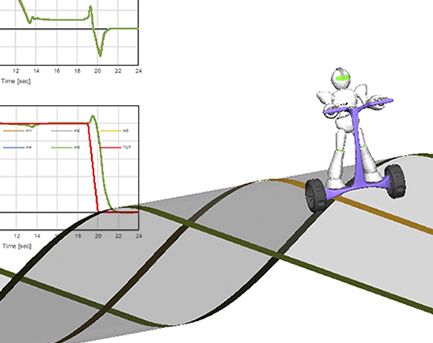 The scooter, road profile, tires, and its robot rider were analyzed with Altair MotionSolve™, Altair’s multi-body solution. The motors were designed in Altair Flux, the general-purpose electromagnetic tool. The control system for motors and stabilizing the system are all done in Altair Activate, an intuitive block diagram environment to support model-based development. Federal regulations prescribe requirements to be met for the emergency landing of an aircraft on water. 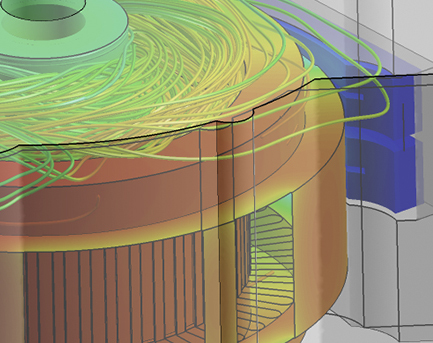 Besides its structural, highly non-linear transient capabilities, Altair Radioss™ features extensive Computational Fluid Dynamics (CFD) abilities to simulate scenarios, such as crashing, ditching or deployment of flotation systems. 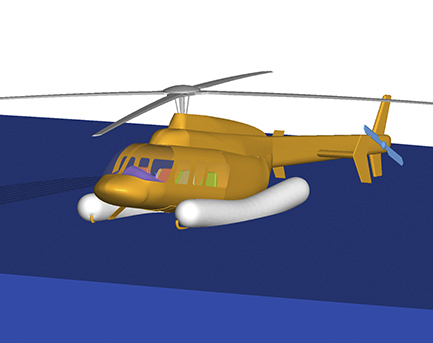 Radioss provides various options for modelling these simulations, such as SPH (Smoothened Particle Hydrodynamics), or ALE (Arbitrary Lagrangian-Eulerian) meshes. The unique Multidomain FSI capabilities result in drastic reduction of calculation times without losing accuracy of results. A huge technological evolution is happening, and it’s already affecting the way engineers and designers develop products. Altair is the right partner to help you compete in this future. A huge technological evolution is happening, and it’s already affecting the way engineers and designers develop products. Altair is the right partner to help you compete in this future.